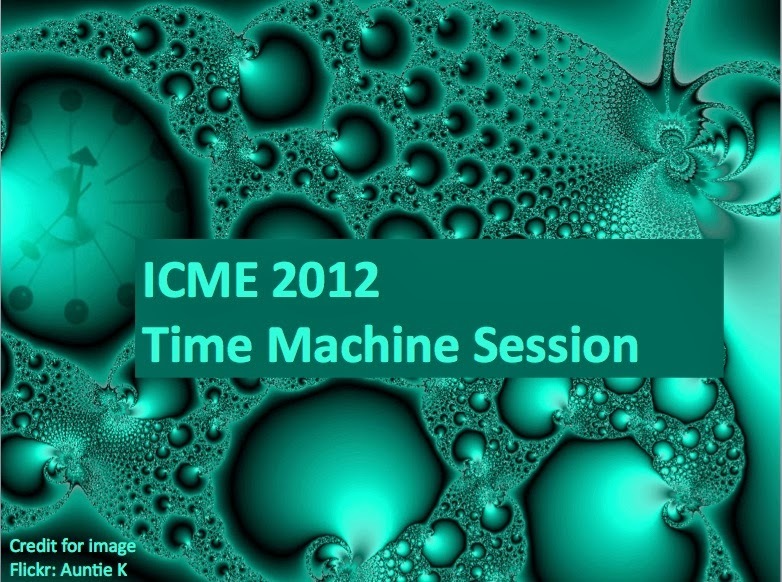 Today was the day of the Time Machine Session at ICME 2012. The session consisted of talks given by experts in the field of multimedia about "Time Machine Topics", defined as: ideas that were published before their time and have yet to reach their full potential. At first, it might sound like just digging around in the past and brushing off some old ideas. Or it even might sound like some futuristic science recycling scheme, designed to make the most of a limited resource. But a Time Machine Topic is far from dusty, outdated or rare. Instead, a Time Machine Topic is a topic that is currently experiencing renewed relevance because of subsequent developments in technology and also in our expectations and needs as users. We think that there are a large number of Time Machine Topics and that some of them bear repeated mention to support the integration of new researchers into the research community and also cross-pollination between related research domains. The Time Machine Session was born at ICME 2012 because Mercan Topkara and I were appointed under the title "Innovation and Demo Chairs". To be honest, I had never heard of a position called "Innovation and Demo Chair" before. The "Demo" part seemed pretty straightforward, but "Innovation"? What could we possibly offer? Stimulate observation and discussion among researchers. Emphasize the benefits of knowing the literature. Streamline innovation by reducing redundancy. Encourage reproducing and reproducible research. For me personally, a major reason for proposing the Time Machine Session is to create a forum where we publicly and, perhaps a bit ritualistically, demonstrate that we as researchers value knowing the literature and knowing where we have been. Google Scholar reminds us that we "Stand on the shoulders of giants" and the Time Machine Session gives us as scientists an opportunity to remind ourselves of exactly whose shoulders those are (and there are lots of them). If Time Machine Sessions exist at conferences (and we hope that there will be more in the future at ICME and elsewhere) we think it will incentivize us as researchers to really study and understand the literature. It will ensure that the "Related Work" sections of our papers are a truly integral part of our research that contributes to the forward movement of our field. I am making the slides I used for the opening of the Time Machine Session available in the hope that they might be useful for other people who want to hold other Time Machine Sessions elsewhere. In the slides, I discuss the session goals in a bit more detail and use plain language and some great mood-setting images. I wanted to explicitly point out that the images really made the introduction special, and here I owe much thanks on Auntie K on Flickr, who is so thoughtful to make some of her work available under a Creative Commons license. More information on the talks can be found at the ICME 2012 website's expert talks page. Also, John N.A. Brown creative a short documentary video at ICME 2013 about the Time Machine Session. The video contains people's reactions to the session and a bit more information on how and why we organized it. Multimedia research is moving ahead in leaps and bounds. In order to pursue the most innovative and productive paths forward, we need an in-depth understanding of where we have already been. The Time Machine Session at the ICME 2012 is dedicated to the principle of improving the future by leveraging valuable insights from the past. The session will consist of a series of expert talks that re-introduce ideas that were published "before their time" and, as a result, were never fully exploited. A "Time Machine Topic" is distinguished by the fact that subsequent technological and social developments have led to a renewal of its relevance, making it currently of critical interest and value to the multimedia research community. A Time Machine Talk covers not only the original idea, but also explains why it currently deserves renewed attention and how it can influence the future of multimedia research. We invite the submission of proposals for oral presentations in the ICME 2012 Time Machine Session. In sum, the goals of the Time Machine Session are to stimulate the creative thinking of today's multimedia researchers and to maintain the breadth of the solution space in which we develop new algorithms and approaches. Additionally, we believe that Time Machine Talks can help streamline and defragment the innovation process, by encouraging reproduction and reducing redundancy. Finally, we hope that the Time Machine Session will stimulate interesting and productive discussion in the community. Importance of re-introduction of the idea to prevent the community from wasting time by "reinventing the wheel"
A 300-400 word abstract to accompany the Time Machine Talk in the ICME 2012 program. Note that the person submitting the proposal does not necessarily need to be one of the authors of the original paper.